I try not to talk or write about politics very often as a normal course of my ministry. My congregation is composed of people of all political stripes, and I strongly believe that no one political ideology has a corner on the Gospel. However, something has been disturbing me as of late about the Wisconsin gubernatorial recall campaigns. It appears that there is a new opposition in the race: the City of Milwaukee. I have received mailings, at least twice a week, from the campaign of Governor Scott Walker. I understand that politics is dirty business, and I understand that Mayor Tom Barrett (the mayor of Milwaukee) is the opposition candidate, and as such his record is up for criticism. However, many of these mailings have criticized Barrett by criticizing Milwaukee. Many of them have highlighted Milwaukee’s unemployment rate, Milwaukee’s school troubles, Milwaukee’s poverty rate. In fact, in his primary victory speech, Walker said, “…we don’t want to be like Milwaukee, we want to be like Wisconsin…” (you can hear his speech here). This anti-Milwaukee rhetoric is what bothers me most about the whole political climate in Wisconsin. Additionally, as an urban minister, this has served as a catalyst for my theological reflection on urban centers in general. Right out of seminary, I was interested in urban ministry. It was a pull that I cannot completely explain. I grew up in a small town (no traffic lights, not even a blinking light), and a city was certainly not part of my upbringing. It was a summer field practicum in an inner city ministry that I felt the internal urging to ministry in an urban setting. I have found that among others, there is often a lot of fear about cities, particularly low income inner cities. For some, it is the natural anxiety that accompanies the unknown; for others, they may have been taught that cities are dangerous places, bad places, even God-forsaken places. I know the narratives that cities are riddled with crime, gangs, drugs, and debauchery of all sorts. I am certainly not going to argue that cities are some kind of utopia, or a place where the Kingdom of God is more evident than in suburban or rural communities. However, I grieve the fear and, at times, hostility to cities. I do not feel called to urban ministry because cities are somehow more deserving or more important than other communities, but because I want to work against the history of churches moving out of urban communities into suburban communities which have tended (at least in the last fifty years) to be more homogenous and have a higher socio-economic level. I believe that God is very present in cities, and that cities have played, and will continue to play, an important role in the church’s mission in the world. Until recently cities have been the major centers for industry, business, living, and culture. Every day as I walk the streets of Milwaukee, I see remnants of the thriving city that Milwaukee once was (and will hopefully become again). Further, cities have been central to my denomination’s history. It was in a city that our denomination was first established on this continent, and it is in cities that people continue to encounter Christ, and continue to be formed into disciples of Christ. I think that there is something unique about a city and God’s work in cities. In fact, in the vision of the redeemed and restored heaven and earth, we see the image of a city — the restoration of human relationships and the model of people living in harmony, peace, and wholeness together. The cities that we know and experience are certainly no where near the ideal of people living together in peace and harmony, but this does not mean that they are completely lost. Cities continue to hold great potential for the Gospel to be spread and for God’s redeeming work to be observed. There is, to be sure, a great deal of suffering and brokenness in cities (as is the case everywhere), it just seems that in many ways, the brokenness of those in the inner-city is more visible. This vivid description of a city, the ideal of what a city should be, in Revelation 21, tells us that God’s plan is not to abandon cities or to abolish cities, but God’s plan is to redeem cities. I think this is something for us to learn from. The church cannot abandon cities, the church cannot ignore cities, and the church cannot simply look the other way from cities and the challenges of cities. As Christ’s body on earth, it is our job to follow God’s leading, and I think that, in part, God is calling us to work for the redemption of cities, to work for the restoration of cities, and to seek the peace and welfare of cities, because when our cities are thriving, we will thrive (Jeremiah 29:7). 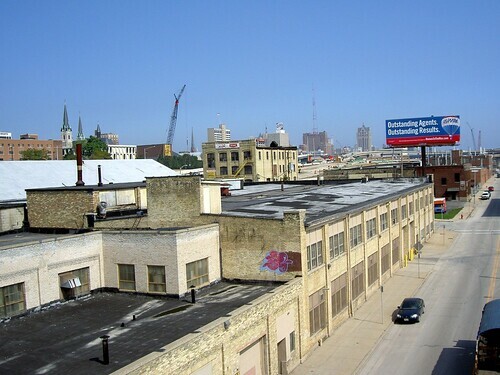 Milwaukee is not the city of God, neither is any city here and now. However, I still believe that in the new heaven and new earth, we will be living in a city, in the perfect city with perfect relationships. Until that complete restoration happens, however, I will continue working in my neighborhood in my city, always looking toward the peace and harmony that we are created for. If God’s work of redemption has already begun, then it stands to reason that we can see signs of it, even (or especially) in the midst of a big city. This entry was posted in Church, Ministry and tagged Church, Community, Evangelism, Hope, Urban Ministry on May 29, 2012 by Matthew van Maastricht.